Located in a pleasant residential area close to open countryside and within half a mile of local shops, junior school and Hurst Green railway station offering regular commuter service to East Croydon and London. Oxted town centre is about one-and-a-half miles offering a wide range of shopping and leisure facilities. The M25 (junction 6) is less than five miles giving access to the motorway network. Approaching Oxted on the A25 from Godstone, continue to the Limpsfield traffic lights and turn right into Wolfs Row. Continue for approximately just over one mile turning right into Chestnut Copse. As Chestnut Copse becomes Pollards Oak Crescent (directly opposite The Greenway) the property is found on your right hand side. 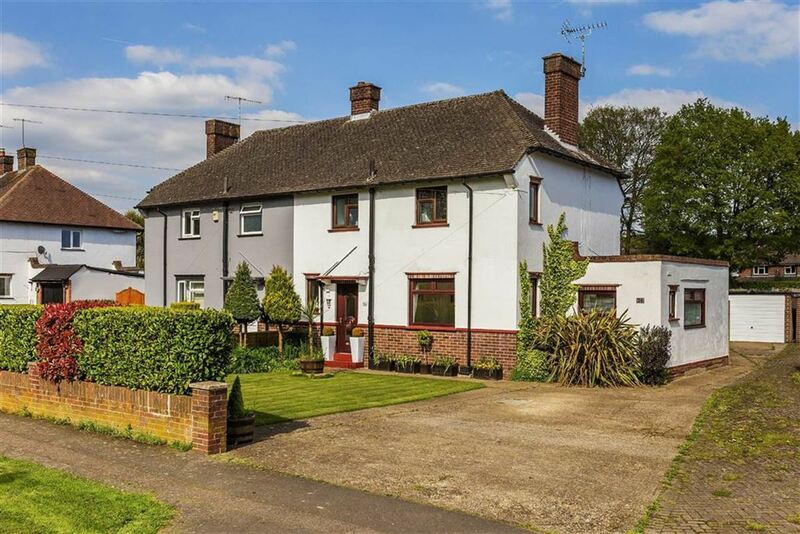 A well presented family home situated in a convenient location for Hurst Green commuter railway station (London approx 40 mins). The property benefits from off road parking for several vehicles together with fabulous manicured gardens. Front and side aspect double glazed windows, fireplace (not currently open), radiator. Side aspect frosted double glazed window, close coupled w.c with dual flush, heated towel rail, ceramic tiled flooring. Rear aspect double glazed window, radiator, integral storage (shelved). Rear aspect double glazed window, radiator, integral storage, airing cupboard (hot water tank, slatted shelves). Front and side aspect double glazed windows, radiator. Front aspect frosted double glazed window, three piece white sanitary suite comprising, close coupled w.c., pedestal wash hand basin, bath with integrated shower over and folding shower screen, part tiled walls, heated towel rail, ceiling spotlights, extractor fan. The front garden comprises concrete off road parking for 4 cars (depending on size), with the remainder given over to lawn, hedging along the front boundary, and a shrub and flower border along one side. The rear garden comprises a patio adjacent to the rear elevation beyond which is a delightful mix of lawn together with shrubs and flower beds and borders extending for some distance towards a further patio at the rear of the garden. An impressive raised decked entertaining area is found at the rear of the garden.